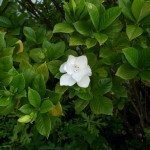 I bring in my gardenia plant every winter and then put it out in the summer. I want to prune it and have brought it in the house already. I have had it for 2 yrs. and it blooms 3 or 4 time a yr. It has grown huge and I need to cut it back. You can prune now if you like, but it will decrease the number of blooms you get in the spring.